Pair-a-Gone and On is one of Luigi's minigames found in Super Mario 64 DS. It has similar gameplay to one of Luigi's other minigames, Pair-a-Gone. To play, the player must attempt to match identical cards which are adjacent to each other. 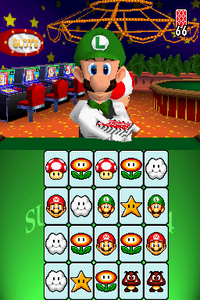 Whenever the player manages to match a set of cards, Luigi deals out more to replace them. Unlike in Luigi's other game, these cards never end and keep replenishing, hence the name. Once there are no more matches for the player to make, the game is automatically ended and the player's score is recorded. This game of Pair-a-Gone goes on forever! Test your skill and see how many cards you can clear. Go for the record! so it could mean "Match until (you're) fed up" or "Commited match". This page was last edited on April 3, 2019, at 09:13.